1 Power supply connection is the base of whole electrics works, so the power access and traces have strict requirements. 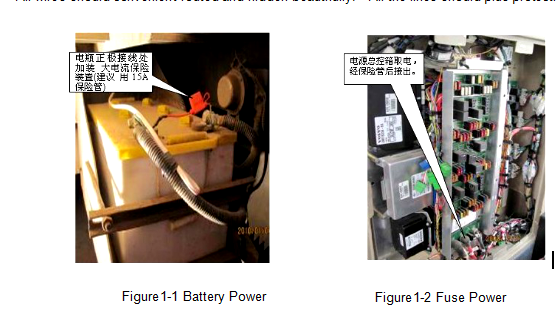 2 Device should get power from the battery directly via positive and negative, or through the fuse box access (Figure 11, Figure 12 Shown). Other power line access is prohibited toprotect the stability and security of host power supply. 3 Select the size and length of the power wire according to the distance to the host. Pouches power cord and wire diameter requires 1.5MM-2.5MM is recommending. In long distance traces should adopt a single line wire (diameter >2.5MM). 5 Power cord connector should adapt solid connections and avoid pulling stretch work. All wires should convenient routed and hidden beautifully. All the lines should plus protective sleeve. Prev: Can MDVR support POE? Next: How to remote setup MDVR?